Mujhe koi chij ki kami nahi hai. Mai bindas hun. Mehnat ka phal mujhe mila hai. (I received the fruit of labour there is nothing shortage in my life) speaks Madan Kumar. 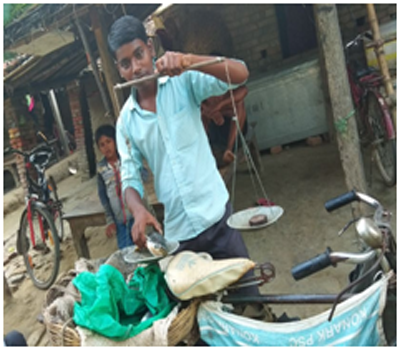 He is 18 years old and lives in Shahpur Undi village in Samastipur. My father is a labour and does not get work regularly. It was difficult for my father to manage the family, so he always thought of searching work for me. But timely assistance by the project MDVS/BDVS brought happiness for my family as well as for me. During the difficult situation I joined in youth group formed by MDBS/ BDVS . Considering my difficulties and financial problem project assisted me with Rs 5000 which was too helpful for me to work independently. With that money I started selling fish near the road side and nearby communities through cycle. Today I am earning Rs- 500/- to Rs -600/- daily. ‘I am helping my parents, doing intermediate from Satrudhan Saran Mahabidyalaya and pushing up my capitals, Heartily I can say I am learning to stand at my own feet that without depending on others, I also enjoy my work’ ‘ I don’t bother for friends making fun at me’ I am heading towards my goal. Within few months I will be a whole seller of fishes this is my hope. Thank you BDVS/ MDVS.